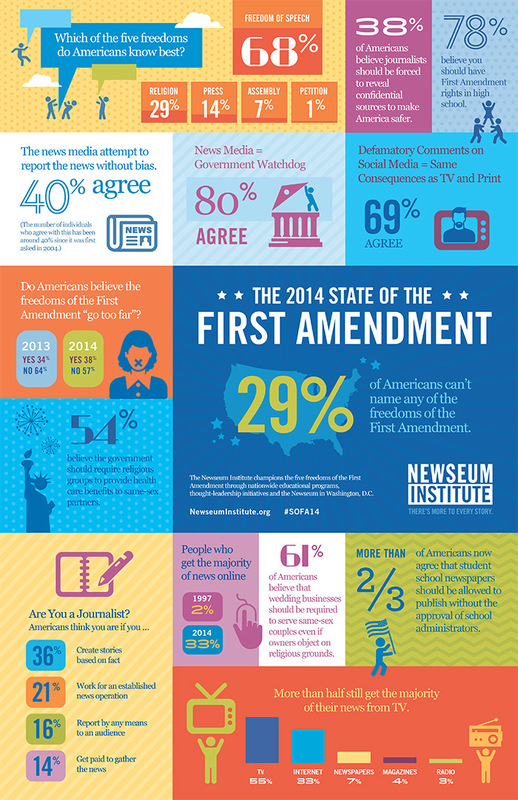 One third of Americans still think the First Amendment goes too far in the rights it guarantees, according to a new survey on the state of the First Amendment released June 24 by the Freedom Forum Institute. 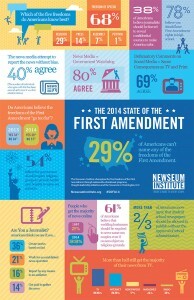 The survey, conducted in May, determines public knowledge and opinion about the First Amendment and related issues. The results were released June 24 at a luncheon for high school students attending the 2014 Al Neuharth Free Spirit and Journalism Conference. “It’s valuable to know the five freedoms, but it’s even more important to know how we can use them,” said Gene Policinski, Freedom Forum Institute chief operating officer and senior vice president of the Institute’s First Amendment Center. 68 percent think public high school journalists should not need prior approval to explore controversial subjects.